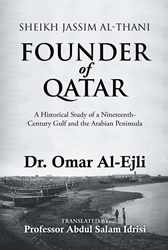 Recent release “Founder of Qatar,” from Page Publishing author Dr.Omar Al-Ejli, is both historical and educational; this work delves into the rich history of a cultured and notable area. Dr.Omar Al-Ejli, an Iraqi scholar and historian, founder of Nahawand Center in Singapore, social activist, history buff, researcher, published writer and author, has completed his newest work “Founder of Qatar”: a gripping and potent work about the history, culture and people of Qatar. Published by New York City-based Page Publishing, Dr. Omar Al-Ejli’s prolific work is the perfect read for any world cultures or history enthusiasts! “Since I lived in Qatar, I became interested in reading about the history of this Emirates. I came across Sheikh Jassim bin Mohammed AlThani quite often as being the founder of Qatar, as an independent political entity. I think that any person who reads what renowned historians, nineteenth- and twentieth-century dignitaries, and officials wrote about Sheikh Jassim will wonder what kind of a person he was to be appraised by his foes as his friends did. I, therefore, found myself searching for sources and documents about Sheikh Jassim and Qatar. This search led me to go further in the history of the Arab Gulf and the Arabian Peninsula as they are closely related to what happened in Qatar.” said author Dr. Omar Al-Ejli. It became unequivocal to the author that Sheikh Jassim was the most outstanding political leader of his era in the Arab Gulf and the eastern region of the Arabian Peninsula. His influence went much further than his country and neighboring areas to reach the Ottoman Sultan. As it is shown in the book, Sheikh Jassim single handedly unified tribes that were fighting for trivial matters and had them pledge allegiance to his leadership. The reader will find Sheikh Jassim a true Muslim in his manners—generous to the poor, helping the aggressed, kind to all people, just in making judgment, etc. He was in front of his army in the battlefield. He was blessed by God with instant thinking and sound mind. Just to cite an example, who would resign his post as the ruler of Qatar after he was victorious in the Al-Wejba battle? Although Sheikh Jassim was the center of this study, it gives the reader the history of the Arab Gulf and Arabian Peninsula as well as some hints on the Ottoman Empire and the role of the British in the region. The author, therefore, tried to dig in deeply through the documents in Turkey about the history of the era before the emergence of Sheikh Jassim and during his long life, not only about Qatar but also the entire region. He visited Istanbul, Turkey, three times for that purpose. He got hold of several British documents as well as books and articles on the subject. Readers who wish to experience this enlightening work can purchase“Founder of Qatar” at bookstores everywhere, or online at the Apple iTunes store, Amazon, Google Play or Barnes and Noble.